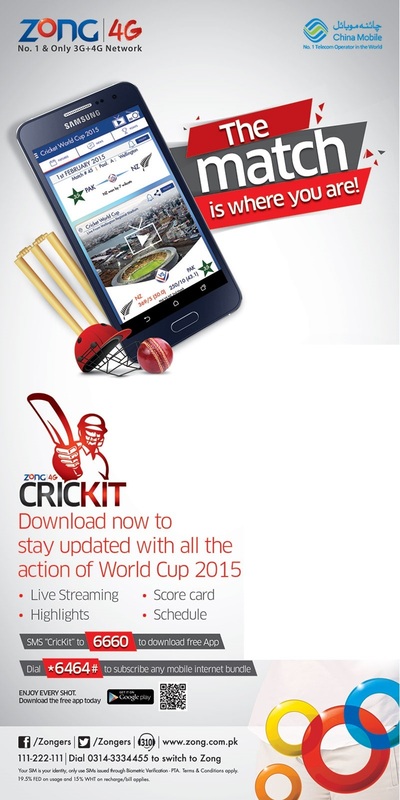 Zong released a cricket app called CricKit. It is powered by PTV Sports and Ten Sports and is entirely free for its data customers. This app is certainly a delight for all Zong users. Features of the app include App features live cricket stream powered by ‘PTV Sports’ and ‘Ten Sports’, live scores, match schedules, point table and rankings, latest news, audio streaming as well as match highlights. He said that keeping in view the craziness of our nation about cricket, Zong has decided to launch online live cricket streams. “We all have jobs to do and this is not possible to take leave from work till the cricket world cup ends so we've decided to bring the best ways to watch the Cricket World Cup Live online,” he explained. “There are plenty of ways to watch live cricket online and many of them are never reliable and you will be forced watching the world cup matches in poor quality with poor sound. However now after launch of this APP our customers can enjoy live HD cricket matches,” he noted. To download this app simply SMS 'CricKit' to 6660 and enjoy HD Quality Live Stream of World Cup 2015 any time any where with Zong fastest 3G and 4G network.